Have you tried a pineapple smoothie recipe with a little kick? 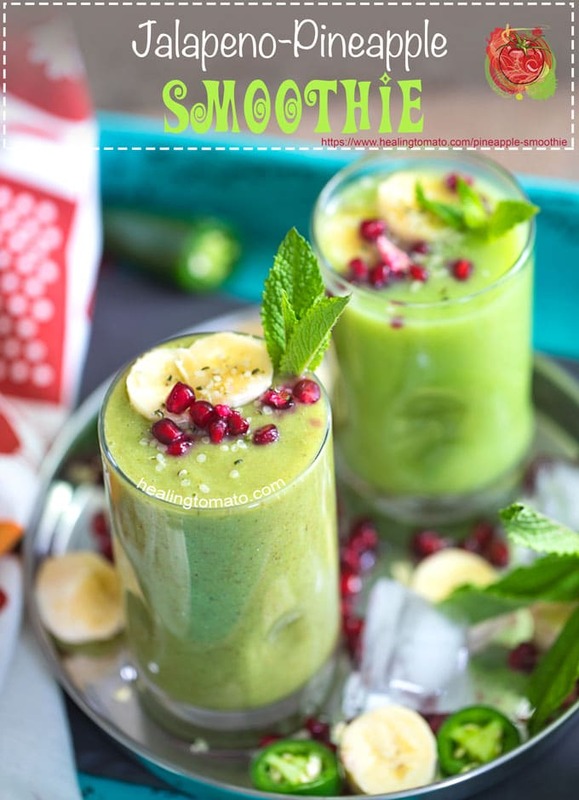 I like adding a little kick to my smoothie and jalapeno is exactly what I need! Adding a little mint to it gives it a cooling taste. 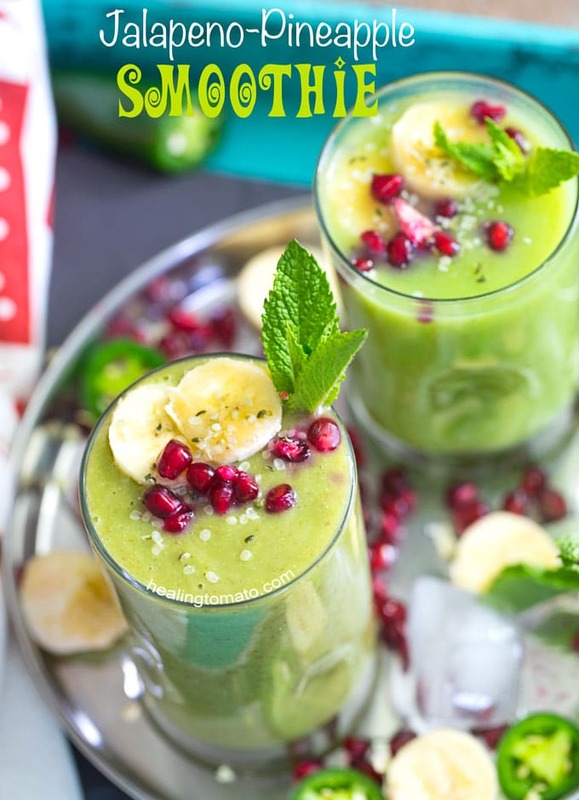 This is now the best green smoothie ever and its great for any time of the year. Pineapple and jalapeno is my favorite pizza topper! This is not news to anyone who reads this blog. A few months ago, I made my pineapple fried rice with jalapeno which is huge in my home. I am in love with this combo and I would love for everyone else to do the same! Today, I bring you recipe #2 of 3 where I use this taste-opposites in a delicious recipe! If you are not a fan of pineapples and jalapeno, this recipe is going to turn your around! Pineapple’s sweetness is exactly what a spicy smoothie needs! Its sweet and tangy making it a perfect companion to jalapeno. Now, before you go and make this recipe, I have to warn you. I put one WHOLE jalapeno in it. Its because I love spicy food and I have a high tolerance for it. If you are a wimp when it comes to spicy food, adjust it to your taste. This makes a great afternoon snack because that spice will give you a pick-up when those 3pm doldrums hit. I love how it cleared my sinuses right up and took away the headache! My concentration came back and I was able to get so much done. 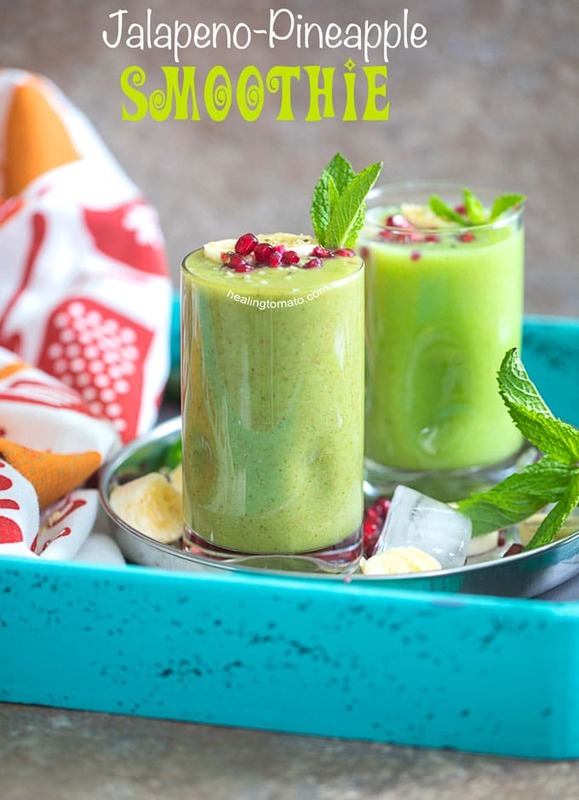 Unlike my other smoothies like this 5 ingredient avocado smoothie or my ultimate antioxidant smoothie, this pineapple smoothie is not for breakfast. I don’t think you want to start the day with a spicy smoothie. But, if you are the kind of person who drinks it for breakfast, please contact me. If you are reading this recipe, chances are that you are an foodie adventurer. And do I have a recipe for you! Check out this chocolate smoothie bowl with peanut butter and avocado. I will bow to your fierceness! I also added hemp seeds inside the smoothie and as a garnish on top. I had a whole bunch left over from my turmeric smoothie bowl, so, I thought they would try them in this recipe too. They were a great addition because it added a slight nuttiness to the recipe and a little texture. If you want to substitute chia seeds, that would be delicious too. My obsession with matcha has spilled over into this recipe too! I added a heaping tablespoon of matcha in this smoothie which gives this pineapple smoothie a nice shade of green! If you like matcha recipes as much as I do (or more than me! ), check out my Matcha Affogato, Matcha Pancakes and Lemon Matcha Cookies. I only added the pomegranate for one reason. They are there to look pretty and nothing more! Look how they make the smoothie pop and make you want to reach through your screen to grab the glass! 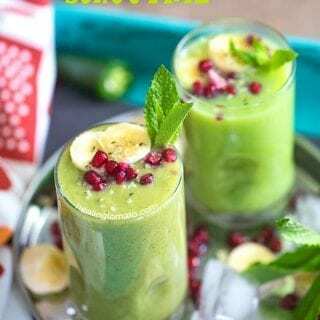 The pomegranate on the pineapple smoothie also added a little crunch when you drink it. So, it may be better than just add color to the spicy smoothie! Left over pomegranates are great in a pomegranate tacos or mung beans salad. I love this pineapple banana smoothie for more than its spice. I like the protein provided by the hemp seeds and flax meal powder. You know how hard it is to get protein into your diet, if you are a vegan. So, I am always looking for ways to incorporate protein into my diet. Lentil has always been my go-to source and I put it into my lentil potato medley recipe. P/S, if you are looking for more vegan protein recipes, I have a wonderful pinterest board where I pin protein-heavy recipes for vegans. Follow the board and to get all the vegan protein recipes I find online. Incidentally, did you know that pineapples make for an amazing pineapple skewer recipe? 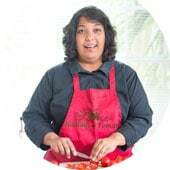 Tell me about your favorite spicy recipe! 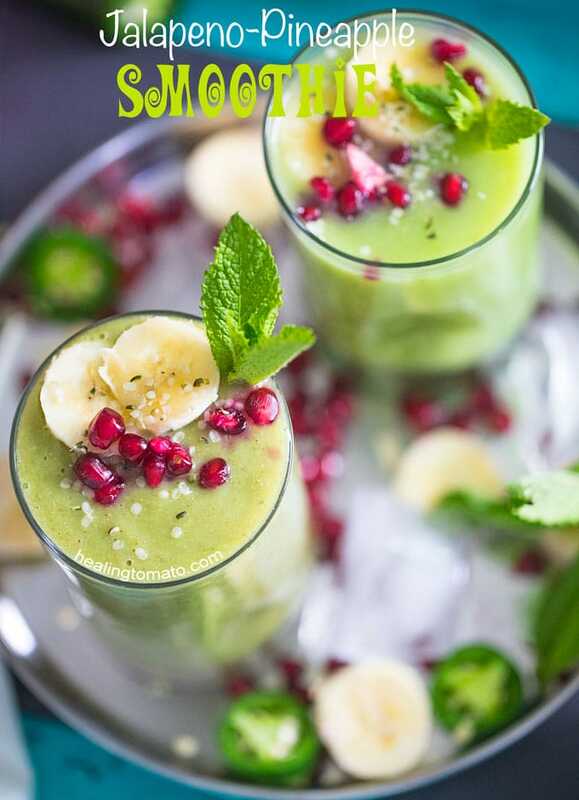 Simple vegan pineapple smoothie with jalapeno. - This recipe will taste just as delicious without the jalapeno. It will be a pineapple smoothie. This smoothie sounds like a tasty ADVENTURE! And it is so pretty, too.